Cyclones are stormy atmospheric systems that have the potential of causing destruction. They are caused due to instability in atmospheric conditions. According to the region and severity of stormy conditions, these storms may be referred to as typhoons or hurricanes. Hurricanes are a type of tropical cyclones that also have the potential of causing massive destruction due to their high winds, rain and floods. A cyclone is an atmospheric system of rapidly circulating air massed about a low-pressure center, usually accompanied by stormy often destructive weather. Storms that begin in the Southern Pacific are called cyclones. A hurricane is a cyclone that is located in the North Atlantic Ocean, or the NE Pacific Ocean east of the International Date Line, or the South Pacific Ocean east of 160E, and with sustained winds that reach or exceed 74 mph. Commonly quite strong. The scale for measuring cyclones is called the Beaufort Scale and Saffir-Simpson scale and may vary in different countries.Winds may approach 300kph and cause widespead damage. Hurricanes are classified into five categories according to the Saffir-Simpson Hurricane Wind Scale. The wind speed and intensity of damage increases as from category 1 to category 5. Southern Pacific Ocean, Indian Ocean. Cyclones in the northwest Pacific that reach (exceed) 74 mph are "typhoons". North Atlantic Ocean, the Northeast Pacific Ocean east of the International Date Line, or the South Pacific Ocean east of 160E. Hurricanes are found near the tropical zone, over warm waters in the Atlantic and Pacific ocean. A cyclone is defined in the dictionary as "an atmospheric system characterized by the rapid inward circulation of air masses about a low-pressure center, usually accompanied by stormy often destructive weather". A hurricane is a type of tropical cyclone with sustained winds that exceed 74 mph and accompanied by rain, thunder and lightning. 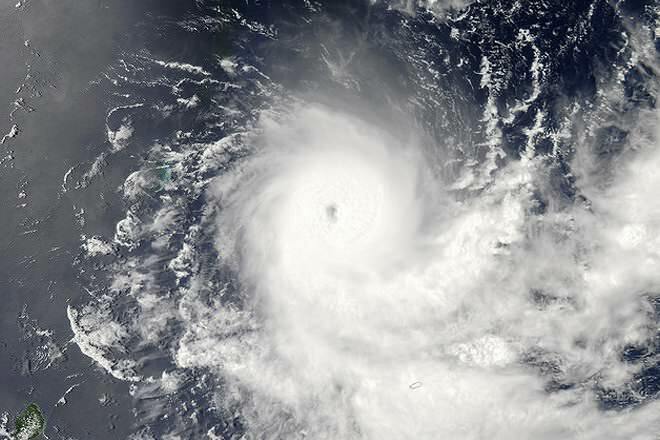 Cyclones begin in tropical regions such as Pacific islands, Northern Australia and other areas. Hurricanes are found near the tropical zone, over warm waters in the Atlantic and Pacific ocean. 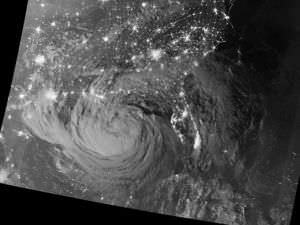 Hurricane Isaac as seen from a NASA satellite on August 28, 2012. 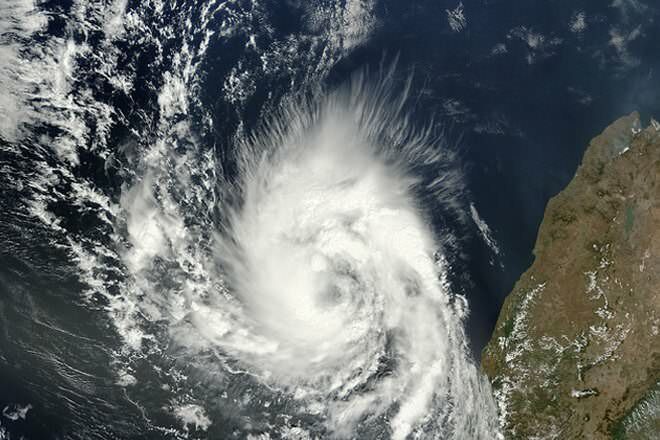 Cyclones have a low pressure center which is called the "eye", and the wind circling around is counter clockwise on the northern hemisphere and clockwise in the southern hemisphere. The speed of cyclones varies from 32 to 200 kmph. Cyclones mainly occur in a particular season and mainly affect the coastal areas. Cyclones can be of six main types: polar, polar low, extratropical, subtropical, tropical and mesocyclones. Hurricanes develop over ocean water warmer than 26.5 Celsius and heat and moisture from the ocean forms the basis of this type of storm. Thus, hurricanes weaken rapidly over land and over cold waters, which cannot provide enough heat or moisture to sustain this storm. The low pressure centers of hurricanes are known as the "eye" and are warmer than their surrounding areas. The eye is surrounded by strong winds and rain and this area is called the "eye wall". Hurricanes have no fronts. The hurricane season peaks from the middle of August to late October in the Atlantic Ocean. Both cyclones and hurricanes turn clockwise in the Southern hemisphere and anticlockwise in the northern hemisphere. Hurricanes are classified into five categories according to the Saffir-Simpson scale. The wind speed and intensity of damage increases as from Category 1 to category 5. Category 1 hurricanes cause minimal damage with wind speeds of 74-95 miles per hour (mph), category 2 cause moderate damage with wind speeds varying from 96-110 mph, category 3 cause extensive damage, with wind speeds of 111-130 mph, category 4 causes extreme damage with wind speeds of 131-155 mph, and category 5 has catastrophic damage with wind speeds of over 155 mph. The scale for measuring cyclones is called the Beaufort Scale and Saffir-Simpson scale and may vary in different countries. The scale for measuring the intensity of cyclones depends on the intensity of damage and the wind speed. The scale ranges from negligible house damage, and destruction of plants and trees to extensive damage and widespread destruction, with wind speed ranging from 74 to 156 mph. There are 10-14 cyclones that occur per year. In the Atlantic ocean, hurricanes occur about five or six times a year. 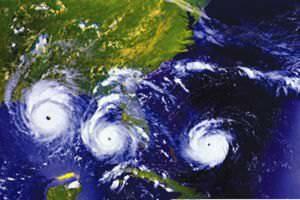 Cyclones and hurricanes are detected by Pulse-Doppler radar, photogrametry, and ground swirl patterns.